China Unicom (NYSE:CHU), the second largest Chinese wireless player, published its Q1 2018 results on Friday, reporting strong revenue and profit growth, driven by its expanding wireless subscriber base and improving ARPU. Below, we provide some of the key takeaways from the company’s earnings. 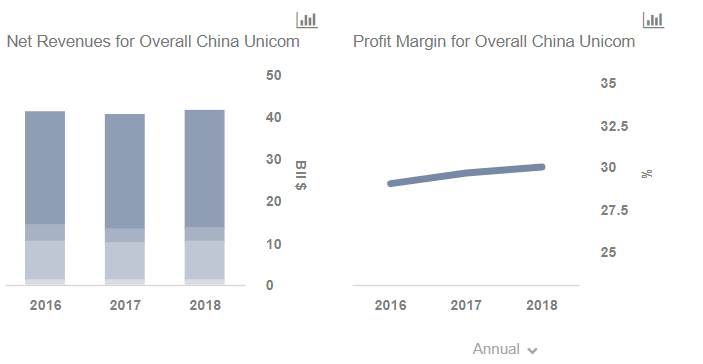 China Unicom’s revenues rose by about 8.6% year-over-year to RMB 74.9 billion, driven primarily by the wireless business, which saw sales grow by close to 12%. The company added a total of 9.78 million mobile billing subscribers over the quarter, up from just about 2.4 million in the year-ago quarter. The improvement was driven by the carrier’s growing 4G footprint and its move to transform its sales and marketing model by leveraging big data and analytics to better target customers. The company’s ARPU stood at RMB 47.9, up by 2.6% year-on-year, driven by its growing 4G mix and higher handset data traffic. The carrier’s 4G mix stood at 66% as of March 2018, up from just about 46% in the year-ago period. The carrier’s fixed-line broadband business also gained some traction, adding 1.5 million customers over the quarter, up from about 1.35 million in the year-ago period, although fixed-line broadband ARPU decreased year-on-year.